Why Does My Dentist in Fort Worth Need X-Rays? The American Dental Association recommends that everyone over the age of two visits their dentist in Fort Worth twice a year for a cleaning and checkup. During your routine appointment, it is not uncommon for x-rays to be taken. They help to provide a deeper insight into your dental health, allowing Dr. John Boyd to see areas that are not visible to the naked eye. However, the images can also be taken when a treatment is needed or to monitor diseases. At West 7th Smiles, we use digital imagery to provide you with high-quality, comprehensive care. Unlike x-rays that are taken for medical purposes, Dr. Boyd uses them as more of a preventive measure; however, they can also be taken after a problem has developed. With the images taken once a year at your routine appointment, Dr. Boyd can monitor your dental health to detect potential areas of concern sooner. This not only prevents damage to the teeth and gums, but also reduces the need for a costly or invasive treatment in the future by gaining a whole picture into your oral health. The images show areas in the mouth that are not visible to the naked eye, such as the roots and bone that is underneath the gum. Dr. Boyd can also see impacted teeth or issues with alignment that will occur even before the teeth erupt. If a problem develops, Dr. Boyd can pinpoint the issue to provide the appropriate treatment. The images are also used to create a course of action when treating dental problems. It allows Dr. Boyd to see the exact damage, such as the extent of a cavity to determine is a root canal is needed. In addition, it can show complications from diseases, like bone loss that is associated with gum disease. At West 7th Smiles, we embrace the latest technological advancements to ensure the images are of the highest quality. With digital x-rays, you are not only exposed to less radiation, but benefit from enhanced comfort and more accurate treatments with high-resolution images. We use the best technology to take a wide range of x-rays, including panoramic images to see the entire oral cavity in one large image. This allows us to see both the upper and lower jaws. In addition to the teeth, we can identify impactions, cysts, tumors, jaw disorders, and bone irregularities. We may also recommend occlusal x-rays, which are helpful when evaluating the developing teeth of children. As West 7th Smiles, we believe in providing high-quality care. To fulfill our mission, we use x-rays as part of our preventive, diagnostic, and treatment processes. If you have not had one taken this year or if you are a new patient, please contact our office today to schedule your consultation with your Fort Worth dentist. 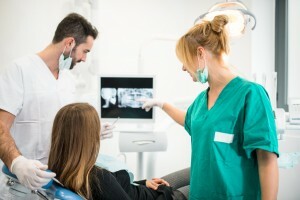 Comments Off on Why Does My Dentist in Fort Worth Need X-Rays?